1. Preheat the grill to high (220˚C) and heat a tray under it. Brush both sides of the tortillas with oil then, in batches, place on the hot tray and grill for 60-90 seconds before turning over. Keep an eye on them so they don’t burn – they should be golden and crisp. Transfer to a wire rack and leave to cool (leaving the grill on). 2. Line the tray with foil, then sit the tomatoes, cut-side down, on top and grill for 6-10 minutes, or until the skins are completely blackened on top. 3. Put the blackened tomatoes in a food processor or blender with half the onion (the rest is to garnish), chipotle paste, garlic, oregano, sugar and salt. Blend to a purée. 4. Heat the olive oil in a pan over a medium-high heat and, when hot, add the blackened tomato purée. Cook, stirring frequently, for 5 minutes (be careful as it may spit a little), until slightly reduced and thickened, then add the stock. Simmer for 20 minutes until it’s the consistency of thick soup; season. 5. Break the tortillas into chips, divide between shallow bowls and pour over the warm sauce. 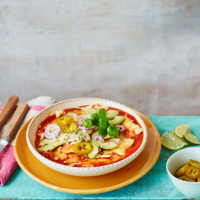 Dollop over the soured cream and scatter over the avocado slices, grated cheese, coriander leaves, reserved red onion and some sliced jalapeños, if liked. This recipe was first published in Thu Feb 22 15:50:46 GMT 2018.